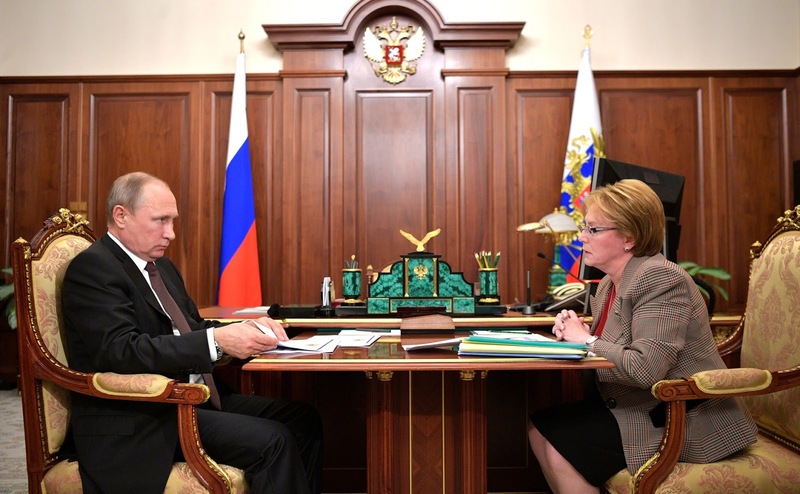 Marina Kovtun briefed Russian President on the socioeconomic situation in the Murmansk region. In addition to the main topic of the meeting, the project to enlist young doctors to work in the North as part of the Arctic Doctor program has been discussed. 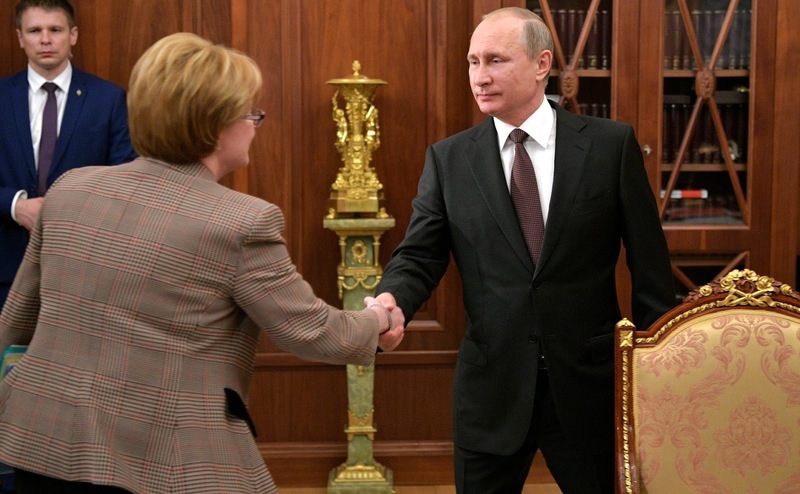 Vladimir Putin met with Murmansk Region Governor Marina Kovtun in the Kremlin. Marina Kovtun told Mr. Putin that there are positive trends in several main economic indicators. During the first nine months of this year, industrial production increased by 14 percent. Metals production was up 24 percent, ore enrichment 14 percent, ship repairs 19.4 percent and the mining industry 10 percent. Investment in fixed assets increased 40 percent, cargo transhipment at ports 70 percent, and production of aquatic bio resources 11 percent. Inflation has slowed, and the situation on the labor market has stabilized. At the same time, tax revenues fell 4 percent short of the target. This has to do with the fact that the regional economy is export oriented and currency fluctuations are affecting tax revenues. Nevertheless, the region has a low, safe level of public debt: In 2017, it is 36 percent relative to revenues and in 2018 it will be 42 percent. 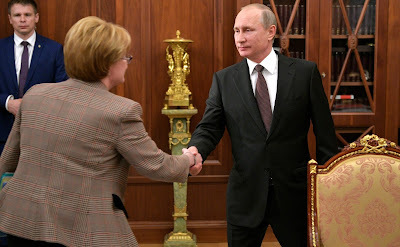 Russian President Vladimir Putin and Murmansk Region Governor Marina Kovtun in the Kremlin. Regarding the implementation of the Presidential May executive orders, the Governor guaranteed that all social parameters will be achieved in 2018. 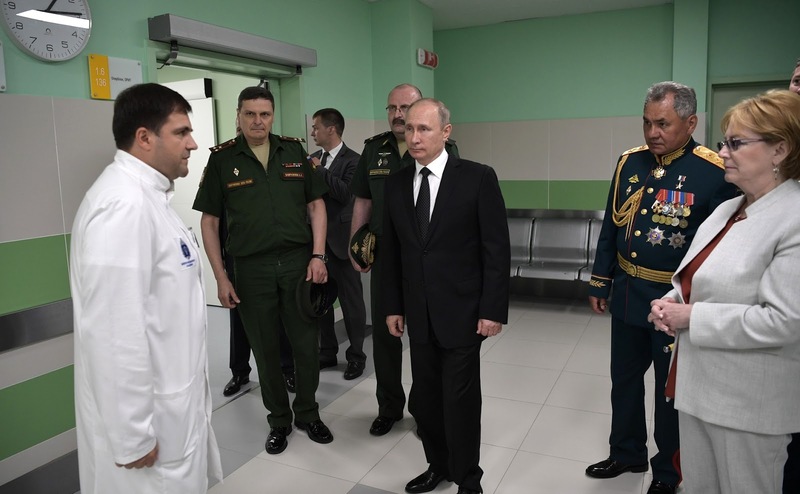 The Murmansk Governor described the shortage of medical personnel as the main problem in the healthcare sector. People are reluctant to go to work to the north, even though wages there are somewhat higher than in other regions, because living conditions are harder: polar nights and harsh climate. Murmansk Region Governor Marina Kovtun. The Murmansk Region has submitted to the Ministry of Healthcare and the Finance Ministry of Russia a draft program, Arctic Doctor, that covers all territories in the Arctic zone. The program calls for 2 000 000 rubles to be paid to doctors who sign five-year contracts: 500 000 during each of the first two years, and 1 000 000 after five years. The Governor hopes that the problem will be completely solved in 10 years. The region currently needs about 636 doctors. Vladimir Putin at the meeting with Murmansk Region Governor. 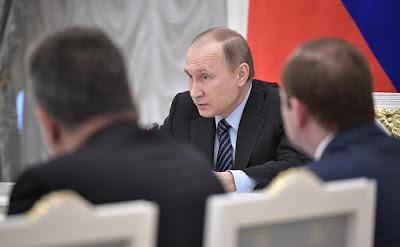 President Putin pledged support for the project, while noting that it must be finalized with the Healthcare Ministry and the Finance Ministry of Russia. Russian President visited Polyclinic No. 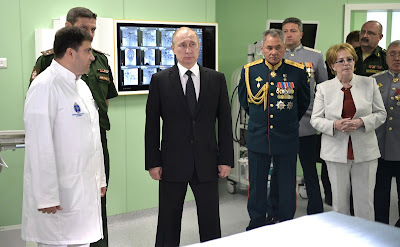 1 of the Kirov Clinical Diagnostic Center as part of his working trip to the Kirov Region. The facility has been participating in the Economical Polyclinic pilot federal project since April 2017. The project aims at increasing accessibility and quality of medical services. 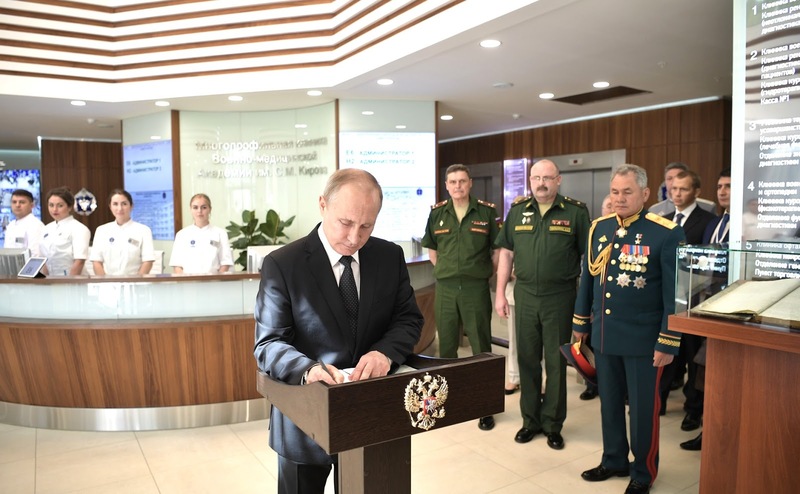 Vladimir Putin visited Polyclinic No. 1 of the Kirov Clinical Diagnostic Center. 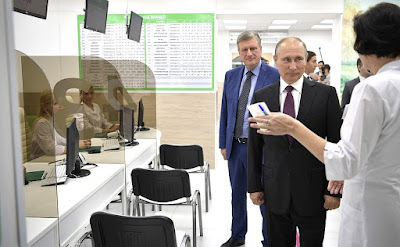 Vladimir Putin toured the polyclinic and learned about the operation of the admissions office. According to Head Doctor Sofya Voitko, as a result of project implementation, waiting time in the medical treatment room has fallen by two thirds to 10 minutes, while the time spent on each patient increased threefold to nine minutes. Surgeon Andrei Kosolapov told the President about a comprehensive medical information system (KMIS). All of the polyclinic’s medical staff are connected to it. KMIS units with a high degree of protection are installed at the doctors’ and nurses’ electronic workplaces; the system electronically stores patients’ records. The effective management of the processes, routing, and electronic queues help to save patients’ time. Acting Governor of the Kirov Region Igor Vasilyev. Vladimir Putin during a visit to Polyclinic No. 1 of the Kirov Clinical Diagnostic Center. Vladimir Putin during a visit to Polyclinic No. 1 of the Kirov Clinical Diagnostic Center. 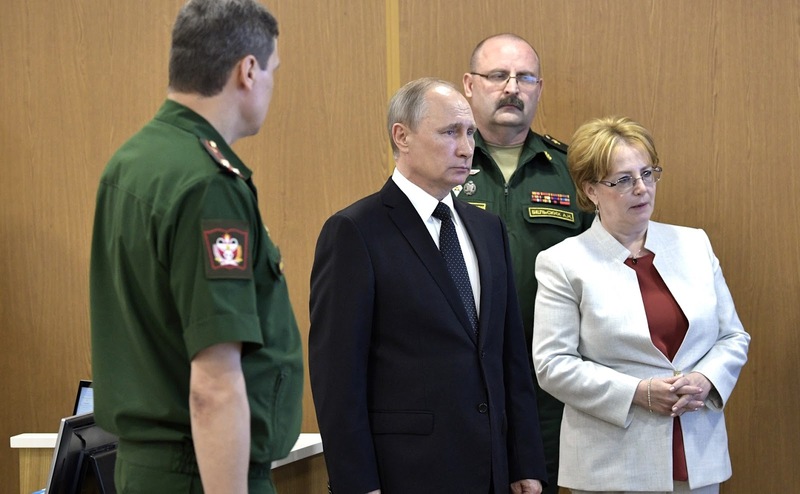 With Healthcare Minister Veronika Skvortsova (left) and Head Doctor of the Polyclinic Sofya Voitko. 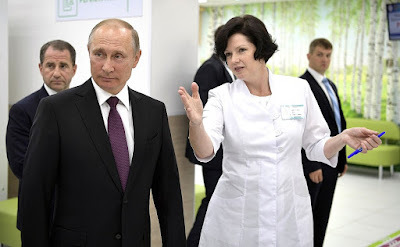 Vladimir Putin with Head Doctor of the Polyclinic Sofya Voitko. Working meeting with Healthcare Minister Veronika Skvortsova. 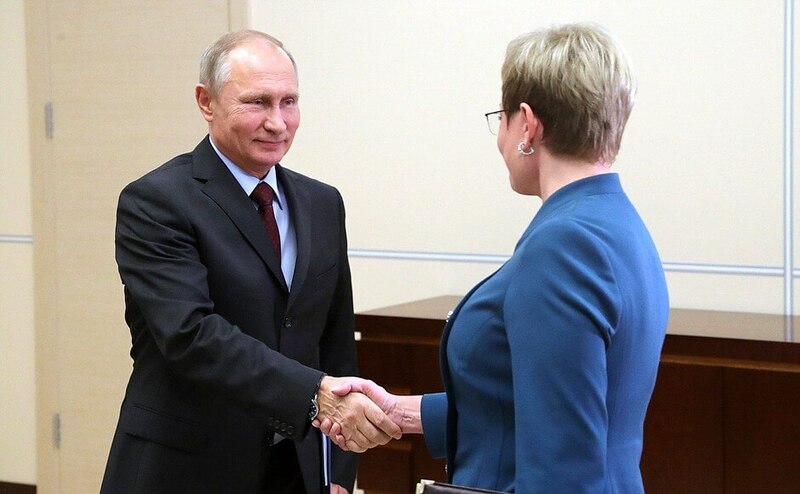 Vladimir Putin had a working meeting with Healthcare Minister Veronika Skvortsova who updated the President on the current status and development plans for the healthcare system in Russia. 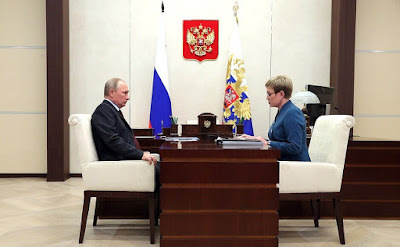 Vladimir Putin with Healthcare Minister Veronika Skvortsova. Ms. Skvortsova, there are many questions, of course, since you work in a very active field. Let's begin with the availability of medical care. Actually, this is the most common reason for complaints to the Ministry, to Roszdravnadzor or regional healthcare departments. We began to deal with this problem systematically from 2014–2015. First, we updated the entire Soviet regulatory framework on demand for medical infrastructure in various locations, with differing populations and distances to the nearest medical center. For the first time, we established wait time deadlines for medical care of various types – emergency, intensive care, primary care, district doctors, planned hospitalization, and so on. Based on this information, we created a geo-information layered interactive map, which shows 157,000 localities, all transport infrastructure and 74,000 medical centers. This map helps automatically calculate the time and distance for each locality to provide a specific type of medical assistance. This slide shows an example: two towns – Apatity and Kirovsk – are 17 kilometers away. This program automatically calculates the time, taking into account the condition of the roads, even making seasonal adjustments – 23 minutes. We can see all available medical institutions with their capacities, beds, specialization and so on, for each location, respectively. This map allowed us to estimate the risks for each region, for residents in each locality by the beginning of 2016. By May 2016, we concluded agreements and signed road maps with all the regional governors to eliminate the risks and shortcomings that we identified. 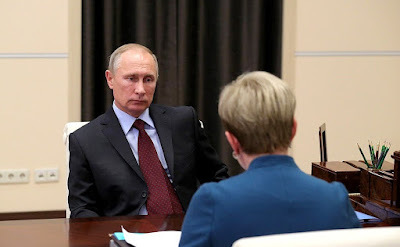 Vladimir Putin and Healthcare Minister Veronika Skvortsova. Over the past five years, we have built 2,000 new medical facilities, most of which are primary care and rural medicine facilities. In 2016, we built more than 550 facilities, 500 of which are paramedic centers, rural medical assistance centers, rural outpatient clinics and offices of general practitioners. Over the past five years, 20,000 medical institutions have been renovated, 2,650 of which were renovated in 2016. They are primarily small facilities but are of great importance for patients in need of primary medical care. Nevertheless, as of January 1, 2017, out of 157,000 localities, we still have 9,900 whose population has limited access in accordance with the norms of medical care of one kind or another. I would like to note that there are 80,000 localities with the population of up to 100 people, 8,866 of which do not have access to primary care in close proximity (at least within an hour). There are 43,000 localities with population from 100 to 1,000 people, 865 of which do not have enough paramedic centers; localities with population from 1,000 to 10,000 people lack 169 rural outpatient clinics. In view of the absolutely clear shortage, we have developed a priority project program for building paramedic centers and rural outpatient clinics and purchasing of mobile diagnostic modules. This priority project was preliminary discussed in the Government at the level of deputy prime ministers, it was approved, and we hope that in the near future it will be implemented to help the regions. In addition, we have been implementing for the second year a program to modernize ambulances. Last year, we upgraded 37 percent of class B ambulances with a run-on operation of over five years and 19 percent of class C ambulances (mobile ICUs). This year, the program will be continued, and at least a thousand vehicles will be purchased for the regions. In addition, for the first time this year we are carrying out a program to develop air ambulances in 34 regions. These are regions with the maximum need for air ambulances; they perform 87 percent of the total volume of services. We are now monitoring this situation. It is developing quite positively, and the regions are very pleased with this opportunity. We hope that this will allow us to accelerate emergency medical care for residents of remote areas. 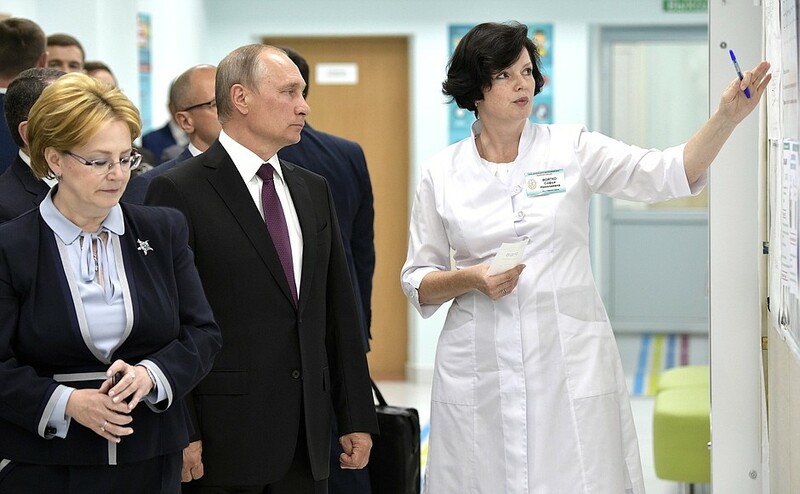 Mr. President, the project we are carrying out with Rosatom experts called Economical Clinic, or a ‘technology factory’, is an important initiative to increase healthcare accessibility. I reported to you about this project last March. At the time the project had been implemented at six outpatient clinics in only three regions, while now it has expanded to 99 clinics in 37 regions. Waiting times have decreased 12 times, appointments have become easier to make, the so-called polite receptions are operating – and this did not require any excessive resources and happened only due to established logistics and better management. It is important to note that there are different lines for patients with ongoing cases and patients requiring a regular check-up. As concerns preventive medical examinations, the first stage can now be completed in one visit. So the program is working. I selected several recent examples for you, from Udmurtia, Buryatia, Yaroslavl Region, Kaliningrad and Sevastopol. Thirty-seven regions are already included in the project. The results have been in fact evaluated very highly by the public. Over the first months since this innovation, the patients’ satisfaction level went up by 10 to 15 percent on average. The patients noted friendly environment and comfort at medical facilities. Staffing in the healthcare sector is an essential aspect of making healthcare more accessible. We receive many complaints regarding the shortage of primary care practitioners, including specialized doctors. Primary care currently lacks 10,700 general practitioners and pediatricians and around 24,000 specialized doctors of 94 specializations. However, progress has been made over the past three years. The number of doctors in primary care has increased by 37,000 (14 percent), including a 25-percent increase in the number of doctors working in rural areas under the Rural Doctor program. There has been a significant increase of 10 to 25 percent in the number of the most sought-after specialists, that is, not only GPs and pediatricians (ophthalmologists, otorhinolaryngologists, cardiologists and neurologists are in the shortest supply). According to our forecasts, we will need two to three years to address this deficit. I would like to report that serious system-wide measures have been taken in order to offset this deficit, prevent it in the future, and ensure that the system is balanced. First, university students will be graduating this year for the first time under a new program and new standards, including physicians and pediatricians, who can start working only after completing a three-stage accreditation examination. As we increased specialized training, which now accounts for more than 50 percent of the curriculum, and enhanced its efficiency to 90 percent, we will have about 11,000 young specialists ready to start working as physicians or pediatricians in outpatient clinics. Taking into account that 5.5 percent to 10 percent of this workforce retires every year on average, depending on the region, we will resolve this situation in a matter of two or three years. Do you expect to have a steady surplus? Yes, we have a surplus so far. It is essential that our young specialists find jobs in the regions. We are working hard on it. This year, the Healthcare Ministry has taken a new step to improve medical residency training. Until this year, people could apply for a state-funded scholarship or enroll on a for-pay basis without passing any exams. This year, however, we issued an order whereby everyone has to go through a basic accreditation examination in order to benefit from graduate medical training. After all, an ophthalmologist cannot treat eyes without knowing how the human body works. In addition, we made enrolment for residency training positions a competitive process, which includes a test, and takes into account the applicant’s achievements, like an honors degree, an individual or presidential scholarship, and work experience at medical institutions. Special credits are given to those who worked as doctors in rural areas. This innovation, which took us a year to develop, will allow us to admit, on an absolutely fair basis, the best students, giving them the opportunity to become specialist doctors. 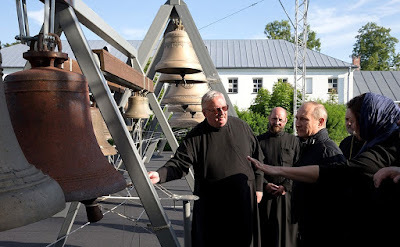 Vladimir Putin visited Konevsky Monastery on Lake Ladoga. 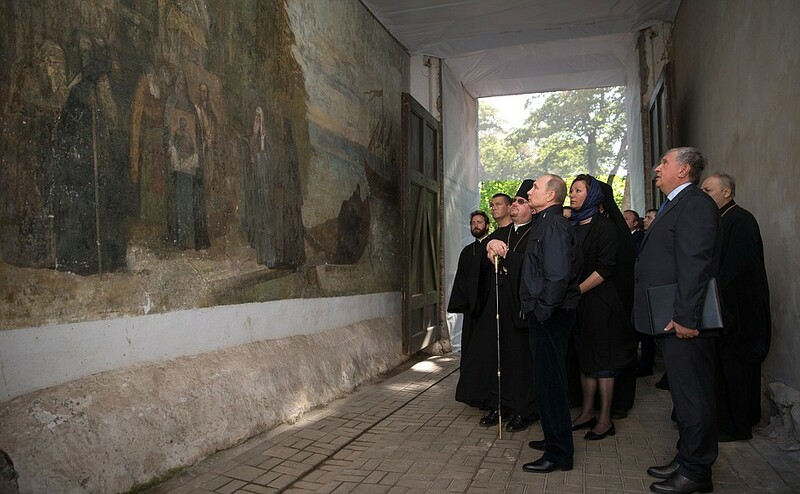 Vladimir Putin visited Konevsky Monastery. During his visit to Konevets Island on Lake Ladoga, Vladimir Putin was briefed on the large-scale project to restore the Konevsky Nativity of the Theotokos Monastery and met with representatives of the Vyborg Diocese. In particular, Father Sergius told the President about the activity of the drug rehabilitation center he established several years ago, which accepts not only Russians but also citizens of other countries. 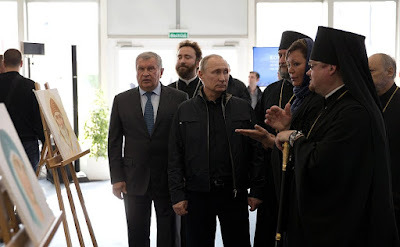 Russian President in Konevsky Monastery. Previously, the center worked in close contact with the Federal Drug Control Service (the service was abolished in accordance with the Presidential Executive Order of April 5, 2016, which transferred its functions to the Interior Ministry’s Main Directorate for Drug Control). Members of the clergy asked the President to help establish cooperation with the agency following its reorganization. 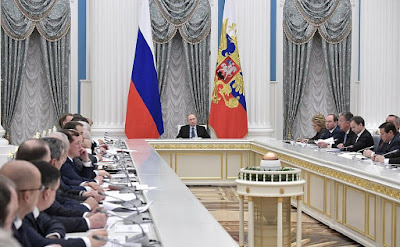 Vladimir Putin discussed the matter over the phone with Interior Minister Vladimir Kolokoltsev and issued the necessary instructions, emphasizing the great importance of rehabilitating addicts and fighting drug addiction, as well as the importance of cooperation between NGOs and the ministry in this context. 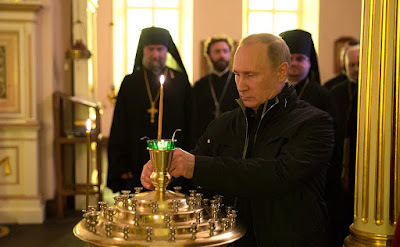 Vladimir Putin in Konevsky Monastery. 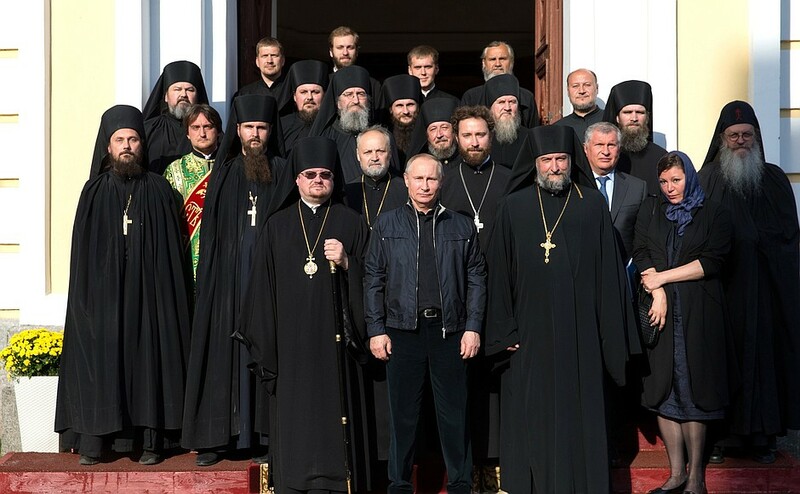 Vladimir Putin on Lake Ladoga in Konevsky Monastery. 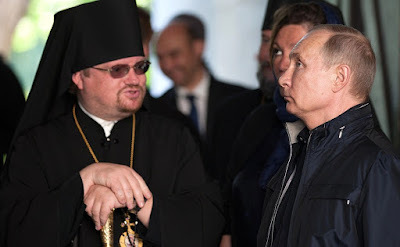 Vladimir Putin and Father Sergius. Russian President Vladimir Putin visit to Konevsky Monastery. Vladimir Putin chaired a meeting of the Presidential Council for Strategic Development and Priority Projects at the Kremlin. Participants in the meeting reviewed progress in the implementation of priority projects in healthcare, as well as measures aimed at enhancing labor efficiency. 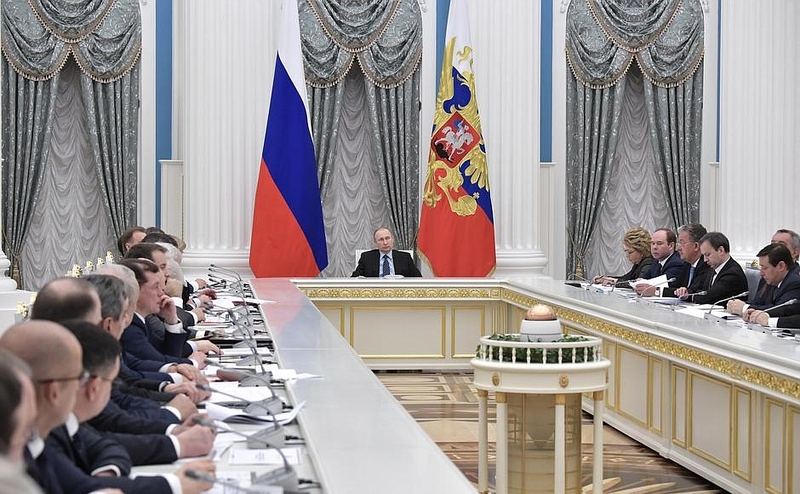 Transcript of the meeting of the Council for Strategic Development and Priority Projects. This is the Council’s first meeting in 2017. We will focus on issues that directly affect the quality of life and wellbeing of families in Russia, and are vital for the emergence of a strong, competitive economy. We will consider the development of healthcare, as well as issues related to enhancing labor efficiency. I will start with healthcare. Over the recent years, substantial progress has been achieved in this area. Of course, life expectancy is a key indicator. It has now reached 72 years. Let me remind you that life expectancy increased by 6.5 years over the past 12 years, from 65.4 in 2005 to 71.87 in 2016. Men now live 7.7 years longer on average and women 4.6 years longer. As you know, over this period infant mortality declined from 10.2 to 6 per 1,000 births, and stood at 5.1 in January 2017. As for maternal deaths, the figures are even better, since the mortality rate dropped more than threefold. An effective maternity and childcare system has been created, and medical facilities have benefited from significant upgrades alongside the development of high-technology medical care. I would like to remind you that the number of patients who received high-tech medical assistance increased from 60,000 in 2005 to 963,100 in 2016, or nearly 15-fold. The number of medical facilities that provide such assistance has increased more than 10-fold, from 90 to 932. We must definitely keep moving forward. We have the conditions to increase life expectancy in Russia to 76 years by 2025 and to considerably reduce the mortality rate among the economically active population. I would also like to point out a few elements that give cause for concern, such as an increase in the death rate among the economically active population in 2015. The increase was not critical, but we must take note of this nevertheless. For the situation to continue developing in the right vein, we must create a modern healthcare system at all levels, from elementary facilities to federal clinics, a system that will meet the highest international standards. We must admit that there are still many unresolved problems, despite the positive changes. People say rightly and with good reason that there are not enough doctors, especially in small towns and villages. It is not easy to make an appointment with specialists or to have a medical examination quickly, and front desk employees are often unfriendly. In the Address to the Federal Assembly, I spoke about installing computers at healthcare facilities but this is only the technical aspect of the problem. I would like to say again that we not only need to connect outpatient clinics and hospitals to the internet, but also to create conditions for people to make appointments with specialists and undergo medical examinations quickly and calmly, including senior citizens who have little knowledge about information technology and electronic records. If we do this, our doctors will have less paperwork and more time for their patients, for improving their professional skills or for receiving online assistance from their colleagues at regional and federal healthcare centers. We need to elevate the prestige and status of medical workers, improve their financial well-being and safety net, including legal protection. Just like education, healthcare is more than a service, since the work that doctors and teachers do is vital to the future of the country and its people. Let me emphasize that the key criteria for success in any project related to healthcare is to achieve the meaningful, tangible results that people expect: prompt and precise diagnostics and effective treatment, a considerate, human attitude toward patients, availability, quality and efficacy of medical drugs. In the Address to the Federal Assembly, I spoke about the need to develop medical airlift services. This is about fair treatment and equal opportunity when it comes to accessing medical services across the country, which is especially relevant given how vast our country is. Of course, we have to think long-term as well, and use the potential of Russian researchers to achieve breakthrough results in genetics, personalized medical care and biomedicine, Big Data processing, and the adoption of best practices at all levels of healthcare. One more thing: it is important not only to treat people, but also to prevent them from getting sick and to promote a healthy lifestyle. We have to keep up our efforts in this area as well. These goals and objectives call for effective management approaches, and substantial financial resources. I expect Ms. Veronika Skvortsova [Minister of Healthcare] to make a detailed presentation on what needs to be done. With regard to the second item on our agenda concerning labor productivity enhancement, clearly, this is a key issue that underlies economic growth. Notably, our targeted efforts have already helped us achieve steady productivity growth in certain economic sectors. For example, according to Rosstat, labor productivity in the aviation industry increased by 15.6 percent in 2012, 27 percent in 2013, and 29 percent in 2014. The figures for 2015 and 2016 are more modest, but overall, Russia’s productivity is generally less than 50 percent of the productivity of the truly efficient economies. Thanks to powerful progress in technology, this gap could drastically increase if we do not respond to it in a timely manner. 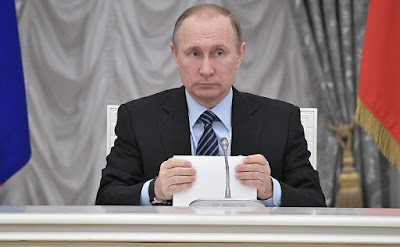 According to the OECD, in 2015, the contribution of one worker to the GDP was $23.18 per hour in Russia, whereas in the OECD countries it was $46.53 per hour. We need to increase labor productivity by at least 5 to 6 percent each year. These figures would be indicative of increased efficiency in the economy and at specific enterprises, the creation of modern jobs and decent wages, meaning that if we resolve this issue, personal income will also increase, and employees will be able to provide for their families and children. Many professional opportunities will also open up to the young people who are just entering the labor market. Working with the regions, and with companies and businesses, it is imperative to build a clear-cut working system for supporting employment and labor mobility. There must be one approach: if an old inefficient job is cut, then at least one new job must be created, both at major modern companies and in small businesses. We realize that small businesses are of particular importance. Each person should be provided with an opportunity to get a new job or to open a business of their own, to improve their skills or acquire another profession; so it is fundamentally important that the program designed to boost labor productivity is carried out in close coordination with measures to train personnel and promote entrepreneurship. I propose testing this system in several regions within the framework of regional labor efficiency. The Government should select these regions and provide the necessary assistance. At the federal level, we should review the legal framework, remove obstacles to the development of a modern labor market and create additional incentives for companies to increase labor efficiency, modernize production and create new jobs. We recently discussed this issue and related proposals from our companies at the Russian Union of Industrialists and Entrepreneurs. I ask the Government to analyze the situation jointly with our business associations, draft amendments to legislation and submit them to the State Duma without delay. As I have said, we must balance the task of increasing labor efficiency against the interests of businesses and the people. There is no question that the people’s right to employment must be protected in this period of technological revolution. And lastly, I suggest creating a federal competence center with assistance from our development institutions. It would promote the best international experience and the best Russian practices in enhancing labor efficiency and improving labor management. The idea is to optimize production and business processes and provide incentives for the workforce. Officials, including those from local governments, and company managers alike must learn these skills. 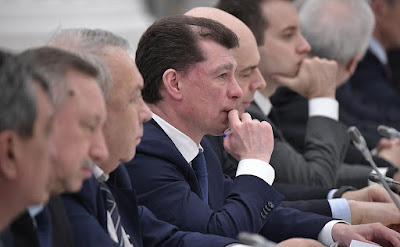 I would like [Economic Development Minister] Maxim Oreshkin to tell us what the ministry thinks about ways to achieve these goals in all these areas. Let us get down to work. Ms. Skvortsova, you have the floor. Creating a nationwide patient-oriented system that unites all medical institutions regardless of their form of ownership or departmental affiliation, that operates under standard quality requirements, with access to medical care and medical worker skills, and that implements state guarantees for free medical care for the people based on social equality, is the main concept underlying Russia’s healthcare development. This has allowed us, over the past five years, to achieve certain positive results in improving our healthcare system, primarily to form a modern system to protect maternity and childhood and to significantly reduce maternal, infant and child mortality rates. In 2013, we restored general preventive medical checkups and health screenings, which have covered 87.5 million adults and virtually all of our children. This made it possible to significantly improve the early detection of diseases, while they are amenable to effective treatment. I would like to say that thanks to active cancer screenings, 55 percent of malignant tumors were detected in their first or second stage last year, which allowed us to reduce the one-year mortality rate to 23 percent and raise the five-year survival rate by over 53 percent. In general, a specialized emergency medical care system has been built based on the creation and proper placement of medical institutions at the second interregional level, which includes over 540 vascular centers and more than 1,500 injury care centers. Over the past five years, the stroke fatality rate has decreased by more than 34 percent and that of traffic accidents by 20 percent. Since 2012, the use of high-tech assistance has tripled, and medical assistance has come closer to people's homes with 932 organizations now providing this assistance. Importantly, over the past two years, in 2015 and 2016, the number of foreign patients coming to Russia for treatment at Russian clinics has surged by 87 percent to exceed 13,500 in 2016. Those patients came to Russia seeking services related to reproductive technology, orthopedics, plastic surgery, cardio-vascular surgery, ophthalmology and dental care. Patients from more than 20 countries within and beyond the former Soviet Union were attracted by high-quality services and affordable prices. At the same time, the number of Russians traveling abroad for elective treatment sharply declined: in 2016, the number stood at 80,000 people, or 0.002 percent of the 33 million people who receive similar treatment at Russian clinics. There were 60 percent fewer people seeking medical care in Israel, and 30 percent fewer people who travelled to Germany. More than 2,000 new medical facilities were built, more than 20,000 facilities benefited from upgrades and 390,000 units of medical equipment were purchased as part of investment projects and programs aimed at improving healthcare. That said, healthcare in Russia still has many shortcomings. A lot has yet to be done to overcome challenges and issues Russians face when seeking medical aid. We have outlined five development priorities. First and foremost, we need to improve the accessibility of medical assistance. By working together with the Russian regions, by 2018 we intend to complete the roll-out of a three-level regional healthcare system based on a single set of requirements regarding the location of medical infrastructure using a special geographic information system, as well as based on single medical standards. This will include visiting doctor services for underpopulated communities with less than 100 residents. There are more than 80,000 facilities of this kind across the country. This way, maximum waiting times for obtaining various guaranteed medical services as per the government program will be respected in all regions. An issue of major concern is ensuring timely emergency medical assistance to patients with life-threatening conditions who live in remote areas with difficult climatic and road conditions. This is why the development of air-borne medicine is one of our priorities. The implementation of this project within two years will help seriously reduce the time of delivering patients to specialized medical centers. The use of digital technologies can greatly increase the accessibility of medical assistance. Online appointments with a doctor and the online issue of prescriptions and sick leave certificates has proved to be very effective. In 2019, we will complete the development of a system of telemedicine consultations in various specialties for various groups of healthcare facilities, including basic national applied research and medical centers. Starting in 2020, we will gradually introduce the system of electronic health monitoring for patients from risk groups. This involves using individual equipment that will measure their blood pressure, heart rate, blood glucose and other blood components, spatial location and other indicators, with emergency response in case of critical changes. The next important development priority is the introduction of standard healthcare quality requirements across the country and the establishment of a quality control system. From 2014 through 2016, jointly with the National Medical Chamber expert community, we created a system of nationwide clinical recommendations for major health conditions. In order to help doctors adapt to the system faster, in December 2016 we finished an online directory of clinical recommendations and a search engine for diagnostic and treatment algorithms by key word and graphologies. The system is being implemented across the country starting this year through doctor workstations, of which we already have 70 percent of the total required number. By the end of 2018, the clinical recommendations will be available in all Russian regions. In line with the clinical recommendations, we have developed criteria to evaluate the quality of medical care to be made statutory. Starting this July, all quality control reviews will be based on these criteria. We set a high value on creating a comfortable and sympathetic environment at healthcare institutions. In 2015, we held the first Polite Reception national contest. The regions selected best reception practices at outpatient clinics and health centers and presented them at the federal level. These practices included comfortable offices, prompt appointments, call centers, appointment and information terminals, and information screens. The contest has become an annual event and has made a significant contribution to the expansion of a positive experience in the country. Special attention should be given to our joint project with the Presidential Directorate for Domestic Policy and Rosatom experts, which is designed to increase the accessibility and quality of medical treatment by optimizing technological processes at medical institutions and eliminating avoidable waste. This technology suite has already been introduced in three regions and showed that it takes no more than four to five months to improve patient logistics, move away from using queues at medical centres, reduce waiting times at doctors’ offices up to 90 percent, double the time of direct doctor-patient interaction, create convenient conditions for regular physical checkups in one visit, and divide flows of healthy and sick patients. We have already achieved some positive results at the first six reorganized outpatient clinics, and have now extended that experience to another 30 clinics. From now on, we plan to actively replicate this model across the country, across all federal districts and regions. To help patients exercise their right to healthcare, in 2016 we began developing the position of insurance agents within the mandatory medical insurance system. Contact centres and text message alerts are being gradually introduced, along with ways to restore a patient's violated rights before any undesirable consequences occur. This patient-oriented system will be introduced across Russia before the end of 2018. The development and implementation of new digital and biomedical technologies is of extreme importance. In 2020, the formation of a unified state healthcare information system will be completed on the basis of a single electronic medical record for each patient. This will ease the introduction of electronic document flow and patients' personal accounts. Any patient will be able to access their account on the system from any computer, obtain the necessary information and excerpts from their medical documents, make an appointment with a doctor or contact the insurance agent. The system will be enhanced with an archive of digital images. Intelligent programs for automated reading of images with a drastic increase in diagnostic accuracy and speed will be implemented. We will introduce a system for automated analysis of the quality of medical care whereby the protocol for treating a particular patient will be run against the system’s standard protocols and quality criteria. By the end of 2020, the system is to be fully integrated with information and analytical systems in mandatory health insurance and circulation of medicines and medical products, which will make it possible to conduct comprehensive analyses of the entire industry’s resource efficiency. Thus, by the end of 2020, we will be able to reach an entirely new management level in the healthcare system, as well as continuity and healthcare quality. Beginning in 2020, according to current plans, automated programs to handle big data will be introduced, which will make it possible to automatically select the best medical treatment protocol for each person with input from telemedicine consultations. At the same time, personalized biomedical technologies will be developed. In the next three years, rapid genome sequencing technology will be introduced, which will allow us to create, by 2020, a unified system of biomarkers of major diseases, as well as modern technologies for monitoring human health and a network of high-tech centers for predictive, prognostic, and preventive medicine. Starting this year, we will introduce regenerative medicine methods based on cellular and tissue technologies. By 2020, a network of bio banks, depositories and collections of biomaterials will be created, which will give a new impetus to developing regenerative medicine with the transplantation of autologous organs and tissues, that is, those obtained from the same individual. At the same time, personalized pharmacotherapy will be developed, including targeted immune preparations for treating oncological and systemic autoimmune diseases; vector vaccines; gene therapy; and genome editing mechanisms. Biophysical solutions in the form of robotics, cyber prosthetics, various joints between human body parts and machine mechanisms will be introduced. Sustainable progress in innovative medicine will be possible through the active implementation of the Health Net and Neiro Net national initiatives, the development of research and education clusters at leading universities and national applied research medical centers, and also the opening of several new translational medicine centers in 2017–2018. We are actively using systems of target-specific innovative development and clinical testing to reduce the time needed for completing innovative projects and providing a clinical and economic framework for their implementation. Medical staff is the main driving force of the development of our medical industry. We continue working to satisfy all regions’ real needs in medical specialists and nurses through the modernized system of training medical professionals. Its effectiveness reached 90 percent in 2016. Advanced training is another key priority. We have created and approved professional standards for core medical disciplines together with the National Medical Chamber. Professional standards for specialists and nursing staff will be completed by 2019. Educational standards and programs will be updated within six months of the adoption of the professional standards. In 2016, we completed the creation of the National Register of Doctors and the unified portal of continued advanced training for doctors, which shows the individual trajectory of each doctor’s professional development. All doctors in this country will become part of the system by late 2021. Also in 2016, we launched a project to gradually introduce a fundamentally new mechanism of licensing doctors based on certification by the professional community, in accordance with international standards. All medical professionals must receive this certification by the end of 2021. Giving people a sense of responsibility for their own health is a major priority for us. To this effect, the comprehensive program aimed at creating incentives for people to live healthy lives will continue: starting from pre-school and school age, children will take special educational modules developed in cooperation with the Ministry of Education and Science, and university students will be offered to join the volunteer movement and engage in sports activities by the Federal Agency for Youth and the Ministry of Sport. There will also be corporate programs aimed at promoting and implementing a healthy environment at work in cooperation with the Russian Union of Industrialists and Entrepreneurs. Tobacco and alcohol awareness projects will continue, and so will healthy nutrition programs and efforts to promote physical activity and sport. The average life expectancy is to increase significantly by 2025 to at least 76 years by 2025 on the back of these priority activities. The average healthy life expectancy is to reach 66 years, infant mortality is to decline to 4.5 per 1,000 births, and the mortality rate among working-age people is to decline. It has to be said that in 2016, a 3.5 percent decline was registered, from 546 to 517 per 100,000, and by 2025 we expect this indicator to drop to 380 per 100,000. 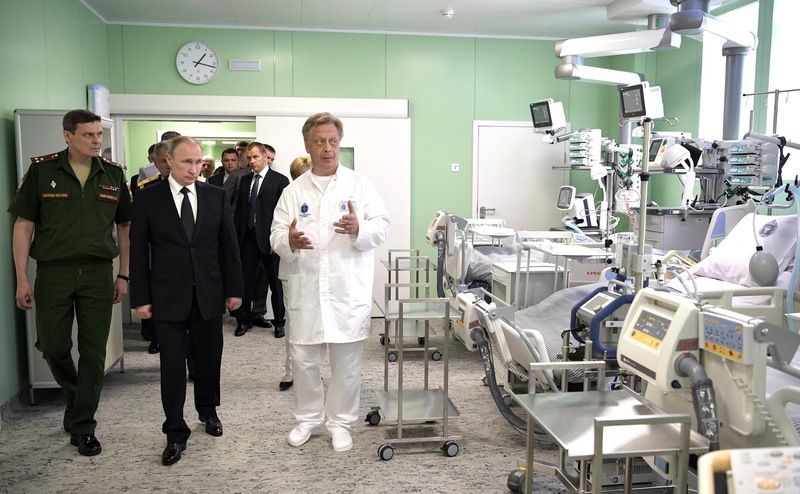 By this time, the health industry will be one of the top sectors of the Russian economy. Russia has all it takes to become a leading player in biomedicine and digital medical technology. Using clinical guidelines, some 3,500 medical and economic standards were developed to put a price on all medical services provided free of charge and to identify deficits in a number of areas. Additional investment is needed to proceed with new pilot projects. We ask you to instruct the Ministry of Healthcare, the Ministry of Economic Development and the Ministry of Finance to carry out a joint analysis of all the necessary calculations to understand whether additional funding will be needed and where it can come from taking into account the projected tax adjustments. Investment in public health promises guaranteed returns for the national economy. Everything you said is important, without question. I think all our colleagues and citizens find it interesting and important to learn about our plans and developments related to using high technology, genome research, the ability to influence the genome and use this knowledge to improve the health of our nation. No less important is the current state of affairs in our healthcare system. Independent assessment of the quality of services provided by medical organisations is critical. Independent assessment is important in any sphere, including healthcare. How do you plan to achieve this? By using public councils at government bodies in the regions? Yes, we will do so. Just a second. You and I both know how public councils are formed. Often they are controlled entities whose creation makes no sense. We need other tools. They are out there. I am not going to focus on them now and waste our time, but there are many of them. We need impartial, independent assessments. Please do not take a perfunctory approach. We do not need just areas of activity. What we need are specific results in each area. There are other issues as well, but I am simply asking you to pay attention to things that, I believe, concern our citizens the most. This is my first point. The second thing is standards. We have been talking about standards for a long time now. Even the previous Government discussed them. We need to reconcile this with the economic wing [of the Government]. Again, we are sick and tired of discussing these standards, and we must advance to the greatest extent possible based on the current situation. It is imperative to move forward in this direction. One more question, actually for Mr. Manturov, about air-borne medical services. We have also discussed it many times: what aircraft will this programme use? Minister of Industry and Trade Denis Manturov: Mr. President, last year the Government decided to add capital in the amount of 3.8 billion rubles to the State Transport Leasing Company, which will be used to purchase Ansat helicopters, five of which have already been purchased by regional operators who will perform these services on orders of the regions. That is, the Ansat project is complete. Ms Skvortsova and I inspected it last autumn and accepted it for operation – this certified machine provides medical services. How many years did it take to get there? It was certified in 2015. We have more than just Ansat and Ka-226 helicopters. We need to speed this process up. What do five pieces of equipment mean for our country? Nothing. Zero. Mr. President, this is just the beginning. We expect that this year the Government will also assist us in increasing the capital of the State Transport Leasing Company in order to supply aviation equipment via operational and financial leasing. This applies not only to helicopters. 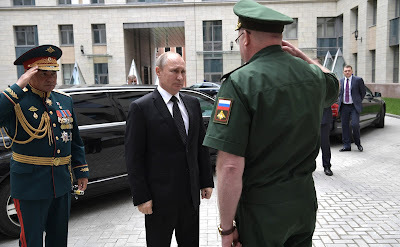 Upon your instructions, two years ago a decision was made to launch the L-410, which can also be used as an ambulance at short distances of up to 500 kilometres. Therefore, I think that we have a good basis to build upon. Taking into account the decisions to develop air-borne medical services, there will be orders and equipment. Where will the production facilities be located in our country? The Urals Civil Aviation Plant located in Yekaterinburg. Our colleagues already delivered the first two vehicles last year to the first customer, which is the Ministry of Defence. Again, due to additional capitalization of the State Transport Leasing Company, the first civilian customers will have their orders filled this year. Every year, the level of localisation will increase. 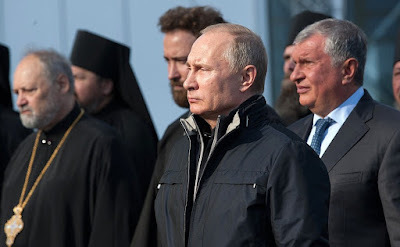 The current stage of development of Russia’s economy is marked by a difficult demographic situation that stems from the grave economic crisis of the 1990s and the aftermath of WWII. Against this background, our labor market is experiencing two problems. The first is a rapid reduction in the number of working-age citizens. According to the baseline forecast by the Federal State Statistics Service, this figure is expected to decrease by 800,000 people per year from 2018 through 2020 and by 600,000 per year on average until 2024. The second issue is the reduced number of young people in the composition of the labor force, which seriously slows down the transformation of the labor market structure. The Ministry of Economic Development has currently entered the final stage of refining the Government’s comprehensive action plan through 2025, which envisages a wide range of measures to accelerate economic growth and reach the global average. The measures aimed at increasing the size of the economically active population and reducing the level of structural unemployment play an important part in this regard. Yet, it is obvious that increasing labor productivity should be the key focus for achieving higher economic growth rates, especially considering that the high level of so-called low productivity employment serves as a major reserve for our labor market. We should note four key issues related to the persistent low labor productivity. The first is the low level of managerial and technological competencies required for a qualitative leap in productivity at problem enterprises. The second is underdeveloped mechanisms for project financing necessary for implementing projects to increase production efficiency. The third is the considerable number of barriers to productivity that appear not so much in the Labor Code as in the numerous industrial regulations that, for instance, pose redundant requirements which lead to the retention of redundant staff members. The fourth is, of course, the high social risks associated with mass layoffs and the often inadequate mechanisms for rapidly finding new jobs, re-training and training personnel. Productivity, a priority project, is designed to address these problem areas, lay a solid foundation and create a managerial and organizational framework to focus the efforts of the business sector, the regional authorities and the federal Government on facilitating the development and implementation of programs to boost productivity at specific enterprises. Regional productivity programs are proposed for this administrative framework, which should ensure, first, the development and implementation of corporate road maps to boost productivity, and second, mandatory measures to provide employment to people who are made redundant. What is the basis for corporate road maps? The first instrument here is the creation of what are known as centers of competences at the federal and regional level. A federal center will form and maintain a generally accessible data base on modern managerial practices and technological solutions in various fields and also provide information about the successful projects to boost productivity at specific enterprises. The general availability of this data base is very important as it will make it possible to multiply the effect, including outside the enterprises involved in regional productivity boosting programs. The federal center of competences should be built at Vnesheconombank (VEB), to which end the latter should receive additional financing. This center will not only ensure the implementation of the productivity project but will also logically complement the project to create the so-called project financing factory that is being carried out by the Economic Development Ministry with the VEB managerial team. Regional centers of competences, which can be built at the existing development institutions, will coordinate the development and implementation of regional programs and help enterprises draw up corporate road maps. The second element in developing corporate road maps is the presidential managerial personnel training program. It can be targeted, among other things, at training both regional teams under this project and managerial personnel at specific enterprises and participants in this program. 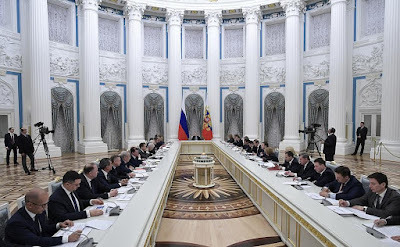 It is important to note that Russia is seriously behind in terms of modern managerial practices, so there is the following proposal: to reformat one of the national economic forums in Krasnoyarsk into a managerial forum as a measure to intensify the sharing of best managerial practices. The venue could be rotated between Krasnoyarsk and Kaliningrad. No doubt, job placement efforts should be coordinated with existing federal and regional programs, as well as with other priority projects, in particular fostering small businesses and facilitating the development of single-industry towns. The tools created as part of these projects will also significantly expand employment opportunities for employees made redundant or for starting their own businesses. Regarding the organizational aspect of the matter, in the next six months we should address the following tasks at the federal level. First, in close cooperation with the business sector, develop and begin to implement a road map on essential amendments to labor, tax and industrial legislation to remove barriers and incentivize efforts to boost productivity. The Economic Development Ministry is organizing this effort together with its colleagues in the Government, above all the Labor Ministry, the Industry and Trade Ministry and the Finance Ministry, as well as with business associations. Naturally, all these amendments will need to be made in close collaboration with our social partners. Second, build a VEB-based federal center of competences. Third, lay the methodological and legal groundwork for regional programs. Fourth, ensure the signing of agreements with the regions and monitor their implementation. Fifth, draw up a plan to expand the functionality of managerial personnel training program. Sixth, develop a program to reboot employment services. Seventh, clarify the set of financial and administrative support tools for the program’s implementation. Regarding the regional part of the program, at the first stage, about five pilot regions could be selected that, during the first six months, should create regional development institutions and draw up regional programs to boost productivity, within the framework of which enterprises should be selected for participation in this program and measures spelled out to provide quality employment for redundant employees. The project’s administrative structure assigns the role of the contracting authority to the Economic Development Ministry; the role of project supervisor in the Government will be assumed by Arkady Dvorkovich. That concludes my report. Thank you. Everything is correct and interesting, but teaching can go on forever and we know this. And it can be done in different ways. The most important thing, of course, is incentivisation, benefits and lifting legislative barriers, as you said, to boosting productivity. Have you, together with the Finance Ministry and your other colleagues, worked on lifting these barriers, including tax incentives? Have you worked on this at the practical level? These mechanisms will need to be finalized. This will in fact be the focus of our efforts in the next few months because, to reiterate, the most important thing is to ensure that these incentives lead to a positive budgetary effect, not to losing money. Yes, indeed, ensure a positive budgetary effect. “Eliminating excess staffing regulations, including the impossibility of outsourcing a particular function”: Outsourcing is crucial. Surely you now that what happens is that outsourcing often amounts to the establishment of quasi-private companies that receive de-facto budgetary funds, and instead of outsourcing we have an increase in budget spending with an end result that is barely acceptable in terms of quality. It is not enough to simply write these things. We should proceed from the reality that we encounter when we attempt to organize this work. As regards tax incentives, what does this mean? I would like to hear from Mr. Siluanov. It is perfectly obvious that this is necessary. It is obvious to me that if we want to carry out all our plans, there should be incentives, and businesses should see the benefits from the introduction of new practices. This is the only way to make everything work. Teaching can go on forever, but if there are no incentives, nothing will happen. Mr. President, in keeping with your instructions, we are working on a proposal to streamline the tax system and this will include a measure to boost productivity at enterprises. As such, naturally, we are considering incentives to create highly productive jobs and incentives for enterprises to modernize their production so as to reduce the number of employees and produce more and better quality goods with smaller numbers. At the other end, employees who are made redundant will enroll on retraining programs within our existing institutions. At any rate, we will use tax legislation to incentivise enterprises to invest resources in innovation and modern technology to boost productivity. What is a tentative timeframe for launching these mechanisms? I believe we should finish preparations by the end of the summer and in the autumn we will move forward with this in pilot regions. Ladies and gentlemen, are there any comments, proposals, considerations or questions on the agenda? The Centre for Strategic Planning presented its proposals and they were largely taken into account. I support the main provisions of Ms. Skvortsova’s report. I would like to note in particular that it puts forward five priority projects. In terms of scale, what can be done by 2024 goes far beyond what has been done on national healthcare projects so far. The scope of change, including in the availability of technology and the quality of medical care for the public, will exceed everything that has ever been accomplished within a space of five or six years. These are the basic concepts. I support these basic targets. I would like to highlight the possibility of transitioning to a healthy life expectancy. This is especially important for us because in the next 15 years, the younger generation, the 20–39 age brackets, will decline by 10 million. This is a demographic forecast and, practically speaking, a fact. The number of people over 40 will increase by 3 million and the number of people over 55–60 – the pension age today – will also increase. In other words, the same GDP, and even a larger GDP, will have to be achieved with a significantly older working population. This means that we should approve – and this is what is in fact proposed – a concept of active longevity, which will set higher standards on medical care and specialist re-training standards. I believe all of this has been duly noted here. I would like to add that we also suggested – and this is reflected in these materials – that this sector can significantly expand the range of its products, including export services. Even with small investments in this sector, relatively small, by 2024, $3 billion could be generated in additional export services. It will work to stabilize our foreign trade balance, which is less dependent on oil. This sector can also make its contribution. I would also like to note that it is considered among the most innovative sectors in the world today. The volume of investment in R&D projects in pharmaceuticals and biotechnology is many times more than any other investment, even in defense research projects. So, the procurement of equipment and technological modernization in this field essentially meets national demand, which generally makes the economy as a whole more productive. So I also support the proposal to increase spending on medical care. Improving people’s health in terms of economic payoff (incidentally, this also boosts productivity) reduces the amount of sick leave taken and improves efficiency. Furthermore, this also provides absolutely new incentives encouraging innovative trends in Russia. To reiterate, this also provides new opportunities. I could point out a few other things but they were already mentioned in general. For example, we believe that the number of pharmaceutical patents could be doubled, making a new contribution to technological development in Russia. But of course, the most important thing is to intensify efforts with regard to healthy lifestyle, that is to say, investing in this sphere, which should be everyone’s concern, can substantially improve the health of the nation and, I would argue, also productivity. Plus, there is an array of sub-projects that were mentioned here and that involve better care for people with chronic conditions, including the provision of medicines, rehabilitation procedures and predictive medicine. Generally, we have also participated in drafting these projects, so we support them. We believe that boosting productivity is crucial for the country’s economic growth. According to OPORA Russia experts, about 40 percent of time in industry is used productively, 20 percent is lost to the inefficient use of labor, 20 percent is spent on lunch and smoke breaks and 20 percent is lost as a result of low productivity. With average wages in Russia at 36,000 rubles [a month], consumers today in effect have to pay over 2 trillion rubles a year for unproductive costs in industry alone. This also makes our goods less competitive (the figures are enormous) and in addition, does not make it possible to raise wages for people who deserve higher wages. We believe that the main issue at the first stage, which does not require any budgetary appropriations, is efficient production organization, which flourished especially during the Soviet days. However, it requires the involvement of company owners, managers and employees. To this end, three tasks need to be carried out: organizational, motivational and cultural. Organizationally, we believe a national committee to boost productivity should be created, as in the majority of countries, which should be headed by a high-level statesman. For example, in Singapore, such a national committee is headed by a deputy prime minister and in Pakistan, by an industry minister. National committees include high-level regional officials. We agree that training centers should be established at the regional level to promote and teach about efficient production organization. In addition, a methodology to measure productivity and impose sanctions for distorting productivity reporting figures is formulated at the governmental level. A reserve of enterprises is formed that are willing voluntarily to join a productivity program. There is an array of measures to incentivize them to join this program voluntarily. What should these measures be, from our perspective? First, compensation for interest, say, up to 5 percent, similar to what is now used by the Ministry of Agriculture. If an enterprise has joined a productivity program and if it really boosts productivity and then takes out loans from financial institutions to procure technology, in this case, it is compensated for the interest, provided all the basic targets are met and this particular technology is in fact procured. The experience of the Agriculture Ministry shows that this mechanism is very much in demand. Furthermore, measures such as tax deductions can be used. If productivity is measured in terms of the added value that an enterprise has additionally generated, that is, if the national budget has received additional tax revenue, only in that case can an enterprise receive a VAT deduction in the amount less than what it additionally transferred to the budget in the preceding period as a result of productivity boosting measures. Cultural aspects should primarily involve promoting via the media the need to boost productivity within the framework of the state order, as well as the implementation of training programs similar to the production organization practices that existed in the Soviet Union. Furthermore, we consider it necessary to create about 100,000 new places at universities to train production management specialists. To reiterate, a qualitative change in the situation can be brought about by involving in this process not only state administrators but also company owners, managers and employees on a mass scale, and we are willing to join it within the framework of our business association. However, this requires a state-level decision and it is wonderful that this matter has been included among our country’s strategic development priorities. Mr. President, first of all, thank you very much for the invitation. 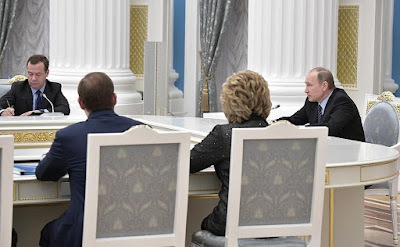 I must say that the entire block that deals with healthcare – the Presidential Executive Office, the Federation Council, the Duma, the Government and the Healthcare Ministry – is working intensely, in endless discussions. This is certainly not boring. I listened to Ms. Skvortsova and I must say – and I am not trying to be flattering – that I admire her. She has all the figures at her fingertips; her thinking is wonderful, strategic; she is a top-notch medical professional; and she does not rely on her aides, but generates new ideas on her own, in keeping with her convictions. Sometimes we argue. True, we will get to personalized pharmacotherapy and regulatory medicine, to everything new that was mentioned in the report, [which was] perhaps not quite comprehensible, [with] a bit of wishful thinking. However, time, faith and optimism are crucial. She is sometimes criticized over the fact that, thanks to TV, when she meets with you, she talks only about achievements and not problems, and TV does not show her tears after Government meetings, when she comes out, unable to achieve what she wanted to achieve. At the same time it is necessary to deal with a load of problems every minute, participate in endless meetings amid the lack of a single healthcare management system and the policy pursued by governors who are responsible for healthcare at the legislative level but pursue their own line. Let us imagine for a moment that the armed forces were organized that way. How would Defense Minister Shoigu feel today? And we are even more vital than the military because every day, it is a matter of life or death, and this is why, for example, in many countries only doctors who are members of the medical community have license to practice medicine. The community is responsible for them and they are responsible to the community. Every year, they expel from their ranks those who have violated ethical norms or unified diagnosis and treatment standards. And this is why they are as good as can be. And what about us? If we want our results and the level of healthcare organization to be as good as theirs, we need to raise healthcare spending to at least 5 percent of GDP. Not 10–15 percent, as over there, in euros, but at least 5 percent, in rubles, not 3 percent, as now. Of course, there is no understanding in this regard, as Mr. Siluanov has repeatedly stated. You know, today Ms. Skvortsova reminded me of Vladimir Lenin with his GOELRO Plan [in the Soviet Union, the first unified state long-range plan for the national economic development]. 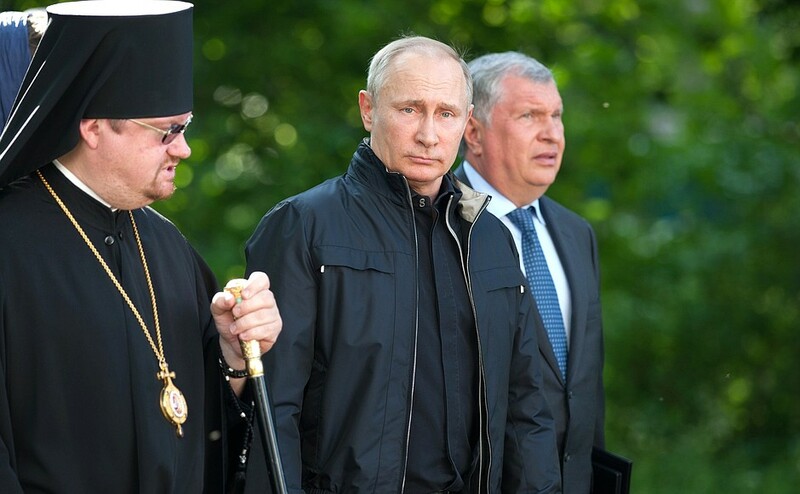 Amid a plethora of problems, it was a kind of fantasy, but the plan materialized, until [Anatoly] Chubais came around. We understand the present situation very well. Let us dream at least. We need to ensure that the Russian people are satisfied with their healthcare system. The people are unhappy with personnel problems in the healthcare system or with the professional level of a ton of doctors even though there are some wonderful specialists that are every bit as good as their Western counterparts. The Ministry of Healthcare has never worked under such difficult conditions as today. I do not fully understand how we still manage to improve indicators amid the ill-conceived optimization. This is a separate issue. We clearly understand that the country is in a difficult situation and we are in the same boat. We make no secret of the fact that all of this is happening amid the general underfunding of the healthcare system, a growing shortage of qualified medical personnel at the practical level and outstanding problems related to medical student training and doctors’ qualifications. By the way, we lack a coherent national program to overcome the personnel shortage. “Some day” is just not good enough for the people now. Today, the situation at the primary care level is on the verge of disaster. We need such a program. It would be a good idea to put this on our meeting’s agenda. Another program, without which progress is impossible and which should be formulated as a national program, involves the entire sphere of professional medical activity that now falls within the purview of the Ministry of Healthcare and the National Medical Chamber, Russia’s largest medical association. Generally, healthcare ministries in all leading countries do not deal with professional activity. All of this is delegated to professional organizations, which are responsible for specialist training standards. And we are grateful to you, Mr. President, for your instruction. Within the remaining eighteen months, a step-by-step transition to self-regulation of professional activity will be codified in law: step by step, without undue haste, carefully, so as not to make foolish mistakes. And we are asking the Duma to facilitate this process. As a first step, together with the Ministry of Healthcare, we are working on a system of state public administration of professional activity. All the documents related to professional activity are being discussed with the National Medical Chamber as an expert community before being signed into law. This is good. What have we been able to achieve by working together? We have overhauled post-graduate education. Education should be a lifelong process for a doctor, not the way things were done in the past when doctors were sent for training only once every five years. However, the system should be convenient for doctors, which requires legislative action. We are developing professional standards in all areas of activity in order to specify what doctors should know, and what skills they should master by the time they complete a graduate course or an internship. This was not the case before. This has turned out to be a daunting task. Standards for 30 qualifications have already been drafted, and we expect this effort to be completed this year. Professional standards should relate to specific employment conditions. For this reason, we will have to continue our work for many years to come. I would like to take this opportunity to thank the Presidential National Council for Professional Qualifications chaired by Alexander Shokhin and the Labor Ministry for contributing to our efforts. Professional standards are used to review educational programs. At the same time, educational institutions should be properly equipped and baseline tariffs increased. The same goes for internships, since we are lagging behind in this area as well. Professional certification has gone beyond theoretical knowledge and now requires practical skills. We are now talking about a new approach to certifying professionals; accreditation commissions have been established in all regions where there are medical schools. These commissions are headed by representatives of medical associations from the National Medical Chamber. What we want is for educational institutions to teach the profession, while we are in charge of professional certification. We made it clear that standards of the past had nothing to do with treatment and were no more than a pile of medical and economic terms. They had to be replaced by clinical recommendations, treatment protocols developed and approved under the law by professional bodies. There are currently more than 1,200 organizations of this kind. These efforts will carry on, and this provision should find its way into the law. We have developed and are implementing the world’s best system for independent professional expertise based on an anonymous document workflow and extra-territorial principle. Make no mistake, all this should also be included in a special program. We are working on these issues, but there are still challenges. I would like to ask you to ease the crippling administrative burden. We face fines for almost everything. No other profession faces this kind of pressure. Let me repeat my personal opinion: we have to get rid of the unnecessary system of insurance companies that have latched onto our bodies and do nothing to improve the quality or accessibility of healthcare services. There are currently 12 insurance companies in our institution only. Each company comes when it wants, distracting us from work. This does nothing to improve the quality of healthcare. This is all just paperwork. Mr. President, you said that it is important to create an insurance system. I agree. However, when I asked insurers what it is be like, not a single company was able to tell me what it means in today’s world. Please, Mr. President, we have to stop increasing salaries of medical workers by cutting staff. Mr. Siluanov does not want to hear about it. Forgive me, if I said something wrong. Thank you for your attention. Like Mr. Roshal, I would like to thank Ms. Skvortsova, though not for her tears or for looking a bit like Lenin. I want to thank her for working so hard to introduce research achievements in medical practice. This is very serious work. We see a powerful effect from the joint work of the Academy’s medical, physical, mathematical and biological institutes. The Ministry, the Federal Agency for Scientific Organizations (FASO) and the Academy joined forced to prepare a program titled Physics in Medicine. The thing is that the ability to understand and formulate problems and to create equipment is very high in physics, as you know. The use of this ability in medicine offers new opportunities. A few examples. Plasma that generates light in lamps is unique in that its electronic component is hot and its ion component is cold. This property can be used to effectively kill microbes that are resistant to antibiotics. We worked with Ms. Skvortsova’s ministry to create a very effective device that employs opposite physical principles, which is nothing new. Take the femtosecond laser. Researchers can use it to emit extremely short pulses that need just one second to cover a distance that is one tenth of the thickness of a human hair. This offers fantastic opportunities in ophthalmology, cell management and in many other areas. As a result of our work, we have created a program, which I have recently discussed with you. In our opinion, this program should be assisted, if possible, considering that it is a very far-reaching program. Physicists would like to join it, too, which would bring together three components – agriculture, medicine and natural sciences – in one program. And researchers from these three fields would work together. I am sure that this will help to make great strides in our work. Mr. President, both issues we are discussing today are very important. Low labor efficiency is one of the biggest obstacles to implementing the task you have set of boosting economic growth. Since we are responsible for developing digital healthcare in the framework of the Health Net roadmap of the National Technology Initiative, I would like to focus on the first issue, which concerns the priority healthcare project. What Mr. Fortov has said here is very important, because new technologies, such as electronic data in medicine, are a graphic example of convergence between medicine and other sciences, in this case, information technology. There is global competition between technologies, groups and even countries not in the field of data collection but in data processing and the implementation of its results. Ultimately, it is not data that is important, but the mechanism of taking medical decisions on the basis of an algorithm created by artificial intelligence. In this case, artificial intelligence uses the analysis process for self-learning. In other words, it uses a large amount of data for learning to divide patients into groups and identify the parameters that influenced the health of each patient. Large amounts of information are fed into the system, and the better this algorithm is tuned (special teams established under the National Technology Initiative have both the necessary knowledge and also international patents), the better the solution it offers. Therefore, we need to create a data format – the quality of the data is extremely important, too – so that these algorithms will not replace the doctor but help him, like a microscope, which does not replace human eyesight but is an additional instrument for enhancing its ability. We must take into account the development of new-generation sensors and feedback equipment, which promises breakthrough progress in the collection of medical data. Mr President, it is also important that broadband internet access will be available at all healthcare facilities by the end of 2018, in keeping with your instructions, and the system will become fully operational. This access is needed not only for hospital staff to play computer games, but for using the data we collect to make decisions that will improve our KPI (Key Performance Indicator). This translates into a higher life expectancy and a better quality of life in Russia, as Ms. Skvortsova said. We will definitely reach these goals if we launch this system. In other words, I am in favor of using the competitive advantages of national medicine, of which there are many. For example, our Chinese colleagues have launched similar projects and invested millions of dollars in them, but this has not helped them create advantages comparable to those our classical medicine has, and so they are lagging behind us. By the way, the growing demand for exporting our medical services indicates the high quality of our primary healthcare, something Ms. Skvortsova talked about. In this context, I would like to ask you, Mr. President, to instruct the Healthcare Ministry to launch a pilot project with Health Net (a Healthcare Ministry supported project) in several regions to collect qualitative data that we can work with, nothing casual, but something we can actually use in decision making. Of course, considering the sensitivity of this information, we must be very careful when dealing with medical data. We can rely on the experience of Rostec that worked on the integrated state healthcare information system and came up with solutions that will be available to every doctor. 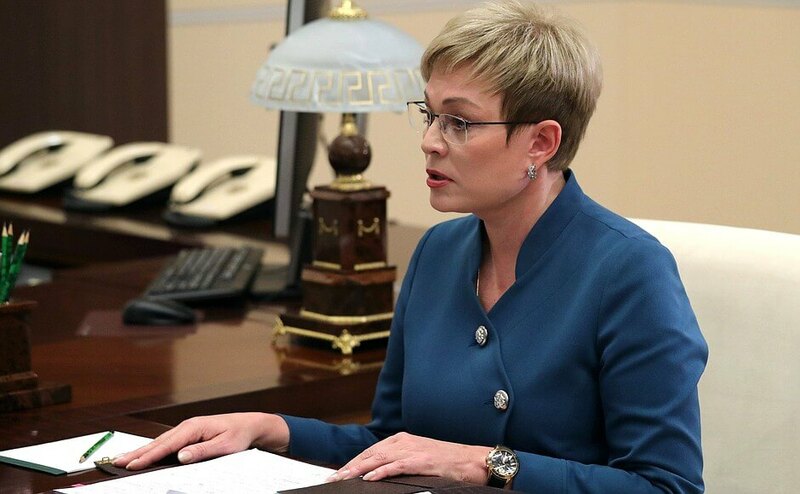 These innovations will be helpful both for the Healthcare Ministry and the Government in making Russia a leader in this area, to improve the quality of life and to increase the life expectancy even beyond the 76 years that Ms. Skvortsova mentioned. Mr. President, I would like to come back to the issue of productivity. I think today we did not discuss one important aspect of this. Productivity is an economic indicator. When technical upgrades and the automation of manual tasks can bring an advantage and profits, businesses will always adapt. We can see it in the reports. For example, in 2013 when the insurance rate on hazardous workplaces was increased, the number of such workplaces started to decrease rapidly. Since then, the number of hazardous jobs has been reduced by 800,000. This is how many people were relieved from occupational health risk only because insurance rates changed. The current situation with labor efficiency is largely attributable to the fact that we have fallen behind schedule we have set for increasing the minimum wage, because labour costs at the lower end of the scale were undervalued. For example, last year 28 million people, or about one third of the workforce, changed jobs. People can easily resign and find a new job. Unemployment has not increased. Our employment offices helped four million people find jobs, and the number of job openings was always above 900,000. The figure reached one million in certain periods, and was sometimes lower, always remaining above the 900,000 threshold. For this reason, in order to sync these processes in terms of labor efficiency, we need to go back to the fundamental issue of increasing the minimum wage, as had been agreed. This increase would immediately solve the issue of low-productivity jobs. In this sense, we are ready to provide every assistance to retrain people in advance, so that they do not face any difficulties in this situation. Mr President, I would like to ask you to issue instructions to this effect, including to the Labor Ministry, because this is a key issue as far as productivity is concerned. I would like to thank all the colleagues who took the floor, primarily those who prepared today’s meeting and discussions. Of course, healthcare and labour efficiency are essential issues, since there is no way we can move forward and there will be no development unless these issues are addressed. What matters the most is that the conversations we had, the great plans and initiatives that were presented do not remain in mid-air. It is for this reason that I asked ministers questions about their plans, future work in these areas, implementation and timeframes. I ask Mr. Medvedev to report on this issue at one of our regular meetings that often take place without the media. I ask you to take this issue under your control in order to ensure that all deadlines are respected and all initiatives that were planned are implemented to an adequate standard. Council for Strategic Development and Priority Projects meeting. 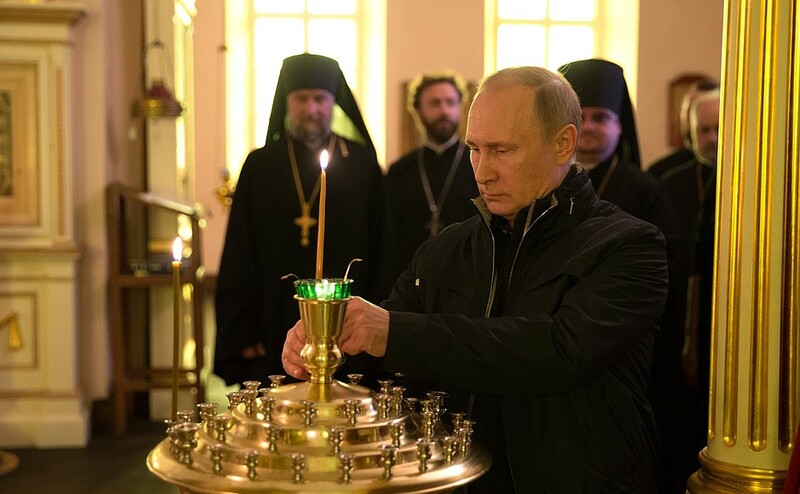 President of the Russian Federation Vladimir Putin. 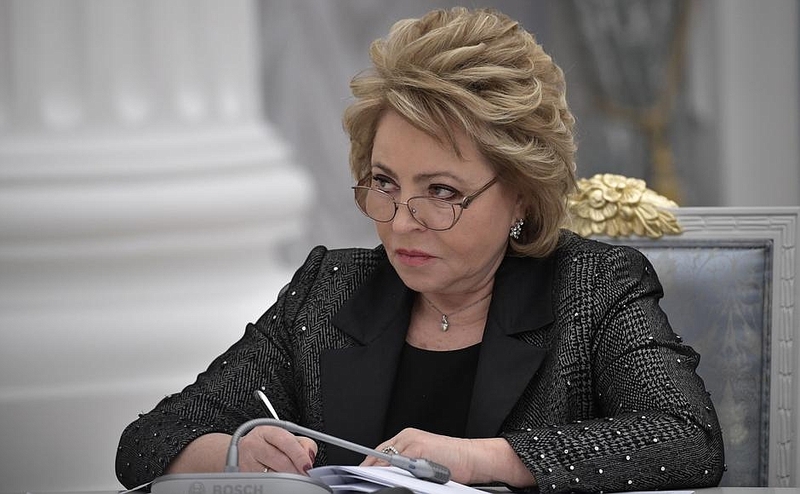 Speaker of the Federation Council Valentina Matviyenko at the meeting of Council for Strategic Development and Priority Projects. 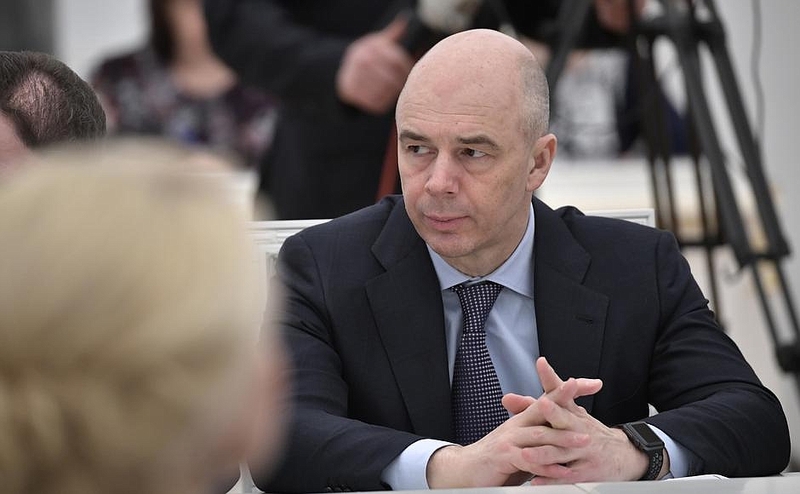 Finance Minister Anton Siluanov at the meeting of Council for Strategic Development and Priority Projects. Labor and Social Protection Minister Maxim Topilin at the meeting of Council for Strategic Development and Priority Projects. At the meeting of Council for Strategic Development and Priority Projects. Vladimir Putin at the meeting of Council for Strategic Development and Priority Projects. 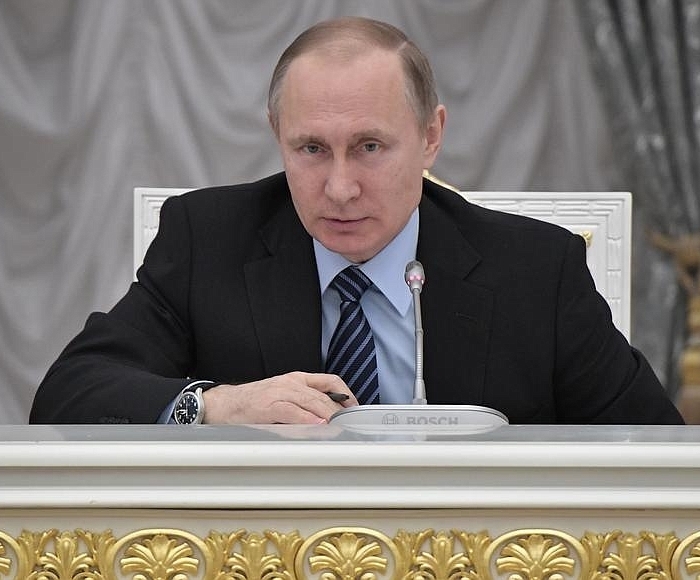 Russian President at the meeting of Council for Strategic Development and Priority Projects.